I’ll keep it short today! These egg tarts are great for lunchboxes. You can make them ahead and they will keep in a lined box in the fridge for up to 2 days. They also reheat very well too. I just lash whatever squishy veg/leftover meat I have in the fridge into the tarts. Don’t complicate things, make life easy on yourself. Note you’ll also need about 200g of rice or baking beans for this recipe but they aren’t eaten and can be used again on another occasion. Preheat a fan oven to 180 degrees Celsius. Line a baking tin (mine is 12cm x 18cm) with baking parchment. Roll out the pastry dough and tuck it into the corners. Using a fork, prick a few holes into the pastry. Cover the pastry with another layer of parchment and pour the rice or baking beans on top. Bake in the oven for 20 minutes. Meanwhile chop the onion finely and the tomatoes into chunks. Lightly cook in a frying pan on a medium heat. I don’t use any oil as the tomatoes are full of liquid. Once the onions are translucent, turn off the heat and allow to cool a little. After 20 mins, take the pastry out of the oven. Carefully remove the filling by lifting the entire top layer of baking parchment and setting it to one side. 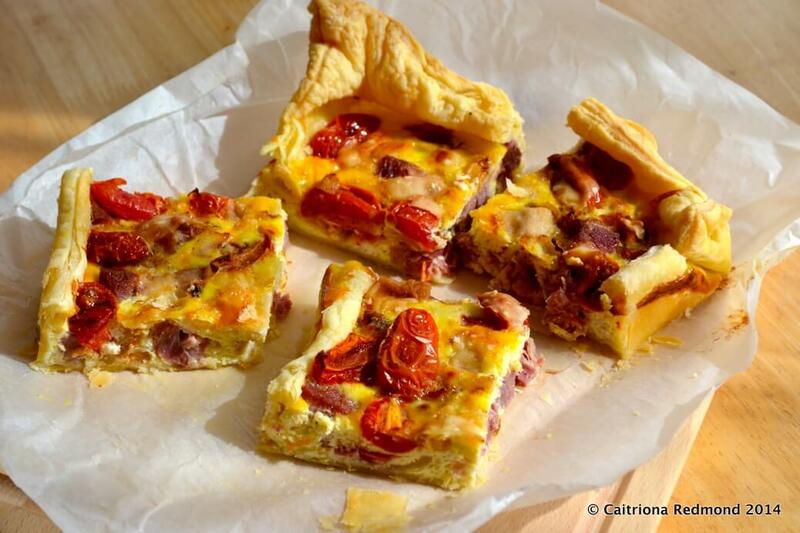 Fill the part-baked pastry case with the tomatoes, onions and any leftover meat you might have. Stir the eggs and milk/yoghurt together in a jug until combined then pour over the top of the filling in the pastry case. Sprinkle the grated cheese on top Return the tray to the oven for 45 minutes. After 45 minutes, remove the tart from the oven and allow to cool completely before slicing. 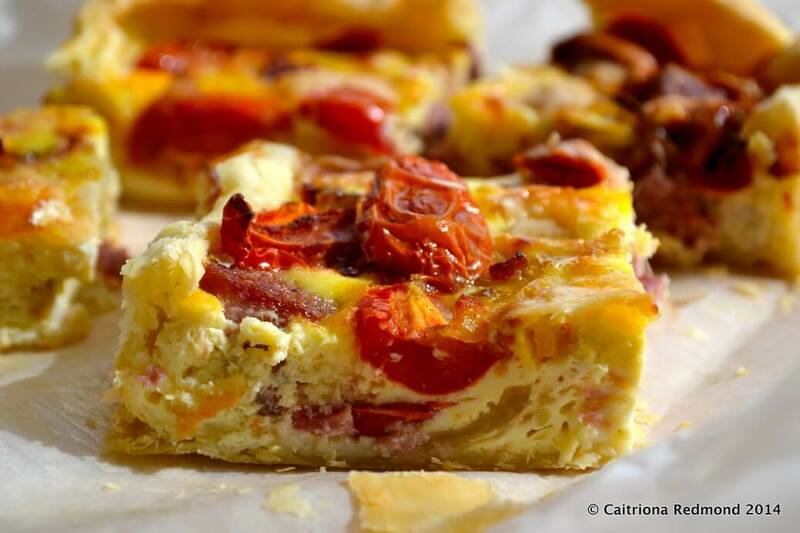 These tarts are perfect for lunchboxes or can be reheated gently in the oven. I like mine with a fresh green salad and loads more sweet tomatoes. Yes this is true! My lot love cracking eggs and stirring. Also good that you can eat from your hand is great for smallies. Did you do something similar in muffin trays before or am I imagining that??!! They’d be easier to freeze individually for lunch boxes. Great recipe 4 after school snacks on the run to activities too. Often have to resort the dreaded granola bars and even home made ones just have too much sugar sometimes. Eggs keep them fuller longer. Thanks for the idea! Parmesan makes everything great! Looks yum!